US-China Today: ofo: China’s Bike-Share Giant Faces Bumpy Roads Ahead . 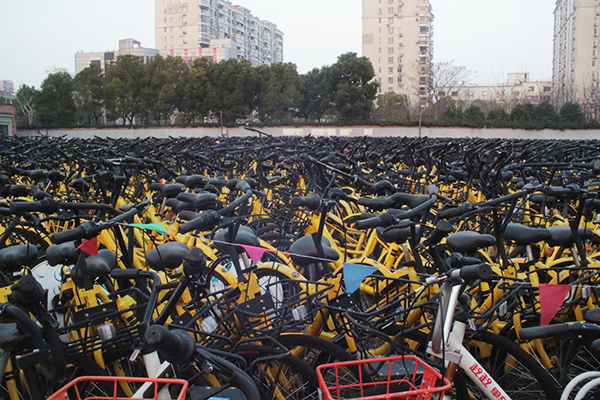 One of China's largest bike-sharing companies, ofo, litters the streets with an excess of its iconic yellow bikes. As the company expands overseas, it faces growing pains domestically. A few years ago, ofo was a small student project operating on a college campus. Now, it’s turned into China’s leading bike-share company and is flooding the streets with so many of its bright yellow bicycles that the Chinese authorities need cranes to remove them. Ofo has 200 million users in 100 cities globally, leading one of the fastest-growing markets in Chinese history: bike-sharing. However, many believe that bike-sharing is a bubble destined to pop because of the lack of a profitable business model and ineffective management of the bikes. Dai Wei, the 24-year-old CEO and co-founder of ofo, first came up with the idea to give Peking University students access to use all the ofo bikes around campus if they offer their own bikes to a bike-share program. Users can look for bikes near them, and park the bikes at their convenience at the end of their trip, instead of at a bike station. After the program’s successful launch in Peking University, ofo quickly expanded to five other college campuses in Beijing, and then to other parts of the city. From then, ofo has been through many rounds of venture funding, capturing more capital each round. Data from Crunchbase shows that ofo received $1.5 million, $130 million, $450 million and $700 million in their A, C, D and E funding rounds respectively. With all this capital in hand, ofo has been doing one thing: expanding. The company recognized that the key to attracting more users is having more bikes: easy access to the bikes means more convenience. In 2016, ofo owned 85,000 bikes; this year, that number has gone up to 10 million. Despite all the capital that ofo has attracted, no one has been able to explain how the company’s business model might turn a profit. Today, ofo operates by charging users $0.07 to $0.15 (0.5 to 1RMB) an hour to use their bikes in China. Their pricing overseas is usually higher, at around $0.50 to $1 an hour, in countries including the U.S., U.K., Australia, Japan, Singapore and others. Users have to download an app on their smartphone, pay a $30 (199RMB) security deposit, and scan a QR code on the bike parked anywhere in the city to unlock and use it. This means today’s ofo effectively operates as a bike renting company, despite being marketed as a “bike-share” company. Its business model is fundamentally different from that of ride-sharing apps like Uber or Didi because it does not provide a two-sided platform connecting riders and drivers. There is no network effect—the value of ofo’s service does not increase with the number of users on the platform. Moreover, unlike Airbnb, there is no significant asset-sharing occurring with ofo. It is not part of the “sharing economy” where companies connect users with assets owned by someone else that are under-utilized. Airbnb does not own a single piece of property but uses other people’s “spare rooms,” whereas ofo directly owns all the bikes its users are paying to use. According to the company’s official website, there are currently around 10 million bikes in use and 25 million rides registered per day. Ofo bicycles are reported to cost $75 (500 RMB) to manufacture. Assuming each rider spends 1 RMB on each trip, it would take about 200 days to recoup the production expense of a bike if riders took 2.5 trips a day. Although this seems like a rather promising calculation, with high expenses for maintenance, as well as theft and vandalism charges, the odds of breaking even drops immensely. Ofo needs to hire numerous maintenance teams to move the illegally parked bikes, and to redistribute bikes in areas with high demand. The maintenance teams are also responsible for tracking down bikes that are vandalized, stolen or reported as broken and unusable. Videos of people throwing ofo bikes into canals have gone viral on the internet, and there are also reports of pranksters and competitors intentionally defacing the QR codes so that users are not able to scan and unlock the bike. Unlike Uber and Airbnb, where most of the tasks involved with purchasing and maintenance are outsourced to users (drivers, hosts and guests), ofo has to shoulder these losses and invest a lot of money and effort into the maintenance of bikes. Essentially, the very factors that make ofo’s bike-share services so convenient—low prices and ease-of-use —have resulted in razor-thin margins and widespread customer negligence, and are making it difficult for ofo to stay afloat. In August, Shanghai’s municipal transportation bureau sent a notice to a number of bike-share companies demanding they refrain from adding more new bikes on the streets. The notice also asked these companies to relocate bikes parked and scattered carelessly across the city. According to Quartz, ofo has dispatched extra carts [to relocate bikes], and have a total of 2,500 operations staff working on cleanup and repairs. By the end of November, Shanghai has already cleared out 500,000 excessive bikes (link in Chinese) put on the streets by bike-share companies. Similarly, authorities in Beijing, Shenzhen, Guangzhou, Wuhan and many other cities also put the brake on adding more shared bikes to the streets. This is no small hindrance for the industry’s core business model. Tight government regulation on the amount of bikes allowed in the cities means that ofo now needs to spend even more resources on maintenance under the government’s tight scrutiny, and needs to figure out new ways to expand their business. In the past six months, six different bike-share companies went belly up (link in Chinese), and over $151 million of users’ security deposit has been lost. In Sept. 2017, many users of Bluegogo bike found that their refund of their security deposit was overdue, and Chinese social media erupted in complaints about the company. With more than seven million bikes, Bluegogo was the third largest bike-share company in China and had expanded their business into Sydney and San Francisco. Nevertheless, the company failed in Nov. in what analysts say is the sign that the country’s bike-share bubble may be bursting, leaving thousands of users without their deposit back. The landscape in China’s bike rental industry has now been settled with ofo and Mobike accounting for 95% share of the market. Although the attitudes of investors behind these companies are growing more favorable towards a merger to end the costly competitive battle, the CEOs of both companies have made it clear that they would not consider a merger. Moving forward, even well-managed and well-funded ventures like ofo will face a challenging uphill climb. "While we appreciate the long hours and the effort that our Chinese counterparts have put into those trade discussions, quite frankly, in the grand scheme of a $300- to $500-billion trade deficit, the things that have been achieved thus far are pretty small. I mean, they're not small if you're a company, maybe, that has seen some relief. But in terms of really getting at some of the fundamental elements behind why this imbalance exists, there's still a lot more work to do." Click here to go our newsletter archive.